MainAll NewsDefense/SecurityJerusalem Terror Victim: "I said 'Shema Yisrael'"
Jerusalem Terror Victim: "I said 'Shema Yisrael'"
Deputy Minister of Religious Affairs Eli Ben Dahan, along with members of the Bayit Yehudi party, on Thursday visited with a hareidi man who was stabbed by Arabs in a terror attack that took place on Tisha B'Av. The 33 year old man is still hospitalized in moderate condition, suffering from stab wounds to the chest and back. 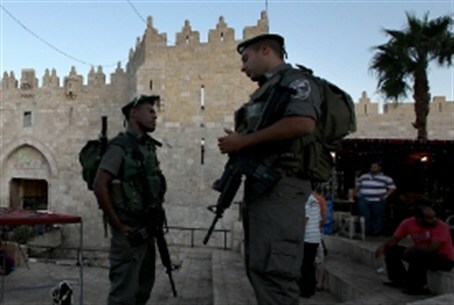 The victim of the attack was set upon by Arab attackers as he walked near the Damascus Gate in the Old City of Jerusalem. At least two Arabs attacked him, the victim told Ben Dahan. They are still at large. “It is impossible to allow an attack like this in a civilized country. Day after day we are forced to deal with horrible terror attacks. It starts with Arab 'price tag' attacks at the Machpelah Cave in Hevron, in which Arabs tear down mezuzot and spray graffiti, as occurred recently, and goes on to a stabbing attack at the Damascus Gate." "The terrorist stuck the knife in me and turned it around. I said 'Shema Yisrael' and other prayers one says” when they think they are about to die. “I walked up the stairs and by mistake called the police instead of Magen David Adom. I saw a patrol and they tended to my wounds right away. All the Arabs in the area just stopped and stared, and no one was interested in what happened to me,” he added. The attack in question was only latest in a wave of violent acts carried out by Arabs in Jerusalem against local Jews. The same night as the stabbing, at the same location, Arab rioters pelted the cars of Jewish residents. A shocking video of the violence was posted yesterday by Arutz Sheva, but went unreported by other mainstream news outlets. The next morning, in the Abu Tor neighbourhood of the capital, Jewish residents awoke to find their car tires slashed in an apparent nationalistically-motivated attack.